Emma Rowson had almost a second in hand on her national rivals as she won gold on the fourth day of the Swim England National Summer Meet 2018. The Stockport Metro swimmer clocked a time of 1:04.15 to win the women’s 17+ 100m Backstroke in Sheffield. Jasmine Iley, Borough of Waltham Forest, clinched the silver in 1:05.03 while Basildon Phoenix’s Emily Lane finished third with a time of 1:06.05. Sara Sylvest, from Denmark, was awarded a commemorative gold for clocking in 1:03.15. Meanwhile, Kate Butler, also of Stockport Metro, finished first in the 16 Years category with a time of 1:05.61. Gemma Elliot touched second for Havant and Waterlooville in 1:05.85 while Leamington’s Abigail Jolley finished third in a time of 1:06.02. In the 15 Years event, Kate Baxter won her second medal of the day. 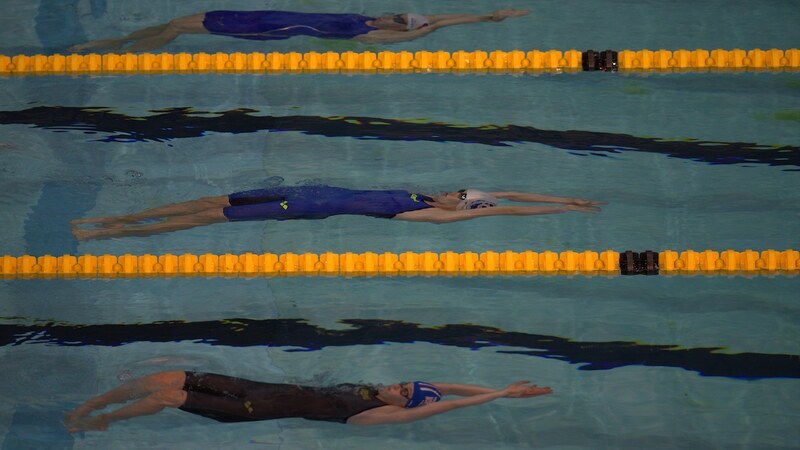 Having previously taken bronze in the Women’s 200m Butterfly, the Portsmouth Northsea swimmer came back from third position at the half way mark to touch in 1:06.24. Guildford City’s Katherine Henderson and City of Birmingham swimmer Lily Massey touched level to share silver on 1:06.36. The 14 Years event saw Lottie James, Abingdon Vale, take home gold for her impressive time of 1:05.91. Lauren Bradley-Holt (City of Salford) finished second in 1:06.84 and Charlotte Thompson of Loftus Dolphins came in third having finished at 1:07.39. Finally, Libby Freeman (Tynemouth) finished first in the 12-13 Years race with a time of 1:07.23. Second place went to Amber Downham from Chesterfield (1:07.23) while Iona Colbert from Grantham touched third (1:07.45). Imogen Meers impressed to clock the fastest time of all age groups in the 100m Freestyle. The Bromley swimmer took gold in the 16 Years final, lowering her PB to 58.05 after a 59.02 effort in this morning’s heats. Meers had the field more than half a second in her wake, with Denmark’s fastest qualifier Julie Svendsen second home in 58.74. Derventio’s Charlotte Hall took the National silver on 59.01 while City of Peterborough’s Mackenzie Whyatt claimed bronze on 59.38. There were some more stand-out performances in the other age groups, not least from Emily Iley, who took 14 Years gold. The Borough of Waltham Forest swimmer – who was fourth in the 13/14 Yrs age group at last year’s British Summer Championships – landed gold in 58.75. City of Sheffield’s Issey-May Reeves was the only other swimmer to duck under a minute in the 14 Years age group, taking silver in 59.76. Meanwhile, City of Manchester Aquatics’ Meadow Dronsfield took bronze on 1:00.17. There was an East Anglian one-two in the 15 Years age group as teamipswich swimmer Emma Cruickshanks claimed gold on 59.15, narrowly ahead of City of Norwich’s Sacha Thomas (59.28). A blanket finish saw Swim Bournemouth’s Ella Chown claim the third spot on the podium, touching in 59.41. Chelmsford’s Erin Little took the title in the youngest age group, breaking the minute barrier for the first time to win in 59.49. Bradford’s Hermione Roe (1:00.05) took silver and Ellesmere College Titans swimmer Katie Hale (1:00.59) claimed bronze. The final gold of the day went to Enfield’s Mia Hawkes as she claimed 17 Years / Over gold in 58.20. A thrilling back 50m saw Colchester’s Erin Duley (58.38) just 0.18 seconds back for silver, and Birmingham Uni’s Jessica Shaw (58.45) come home for bronze. The men’s 100m Backstroke event saw David O’Loughlin touch first in the Men’s 13-14 Years race. The Millfield swimmer finished in 1:01.08, almost two seconds ahead of the rest of the field. Second place went to Aiden Symons-Brown from Davenport who touched 1:02.56 while the bronze medal was awarded to Charles Hazell of Rushmore Royals with a time of 1:03.21. The 15 Years final was a closely contested race with Joshua Skinner eventually pulling clear to finish first for Nova Centurion (1:00.63). Second and third place went to William Ellis of Borough of Stockton (1:01.53) and Brogan Hyde of Bracknall (1:01.62) respectively. Aaron Beckford claimed the title in the Men’s 16 Years 100m Backstroke. The Derwentside swimmer was the only person in his race to break the minute-mark and clocked 59.87. Silver was stolen from Shakil Giordani by Ross Philp of Staines Swimming Club. Philp finished in 1:00.32, having overtaken Giordani on the second leg. Haringey swimmer Giordani touched in 1:00.64 to settle for the bronze. In the 17 Years age group, Jacob Newcombe was fastest away, and maintained his lead throughout. The Mount Kelly athlete touched in 58.12 just ahead of Blythe Barracudas’ Leondis Sarigins. Sarigins clocked a time of 58.53 and Billy Dewhurst (Preston Swimming Club) took third place in 58.97. There was a Danish one-two in the 18+ Years race. Alexander Gliese and Gustav Friberg finished in 55.61 and 57.64 respectively and were awarded corresponding commemorative medals. Oliver O’Halleron received the Swim England National gold for his time of 58.00. The Derwentside swimmer came in just ahead of Mount Kelly’s Samuel Pease who finished in 58.56 to take the silver. The bronze medal went to Arran Bostock of Pioneer 79 with his time of 58.59.